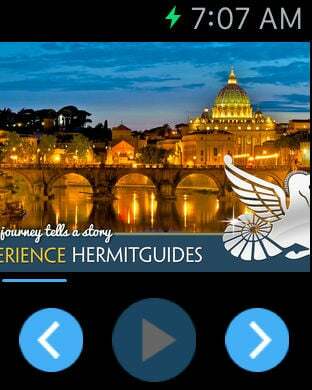 At HermitGuides, each walk is an intimate look at the world’s most vibrant cities. We’re devoted to creating the best possible walking tours - uncovering the quiet corners, sunlit piazzas and hidden passages you may never discover on your own. HermitGuides are real people like you - we get lost, we get blisters, we get hungry, we laugh and we cry. We tell stories that fire the imagination - be it tale or truth. We’re for travellers willing to venture into the avant-garde, the eclectic and sublime. One path, one street, one story could change you forever. Take a walk with us. •	Walking is the best way to truly experience the world with all of your senses. •	Our walks give you the freedom to enjoy the best of a city at your own pace. •	No heavy guidebooks, no organized tours. •	Easy to use, easy to follow walks are presented in a simple and elegant interface. •	Detailed maps with turn-by-turn directions. •	Offline mapping takes you where you want to go – no expensive downloads. •	Big, beautiful photos - see the sites just as we walked them, lived them and loved them. •	Download the App for free giving you unlimited access to all our tours. •	Spread the love - share your adventures with family and friends.